Hello and welcome to the Clique Kits April Pep Rally! You should have arrived here from the ever amazing Nicole. If not, you can start your hop over at the Clique Kits blog, to not miss anything! This month we're celebrating Clique Kits' 1st anniversary and I'm so happy to have been part of all the fabulous-ness right from the start. It has been an amazing year!! Our challenge this month is to create something that shows celebration, in any way you want. Right now I'm celebrating Spring. I'm not a Winter person at all and as soon as I see these flowers pop up, I know the good weather is on it's way! 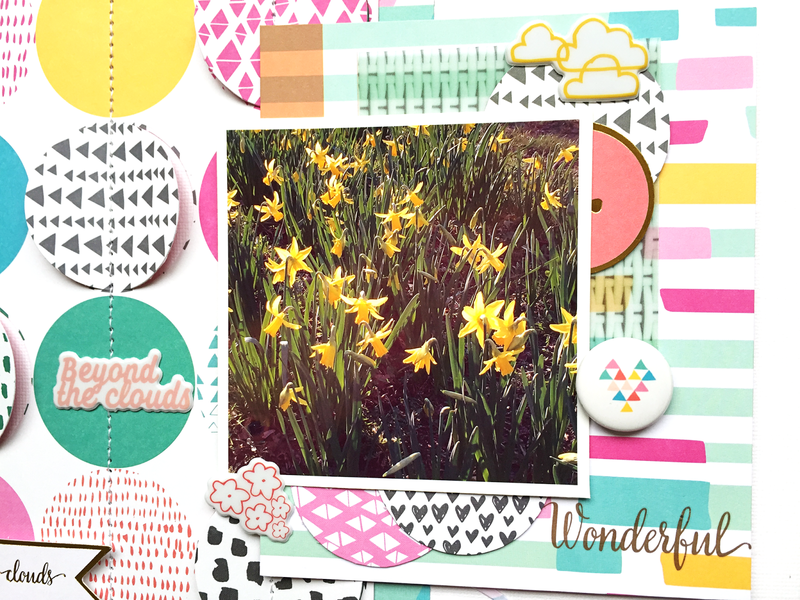 For my layout I used, of course, the gorgeous April Happy Everything kit. 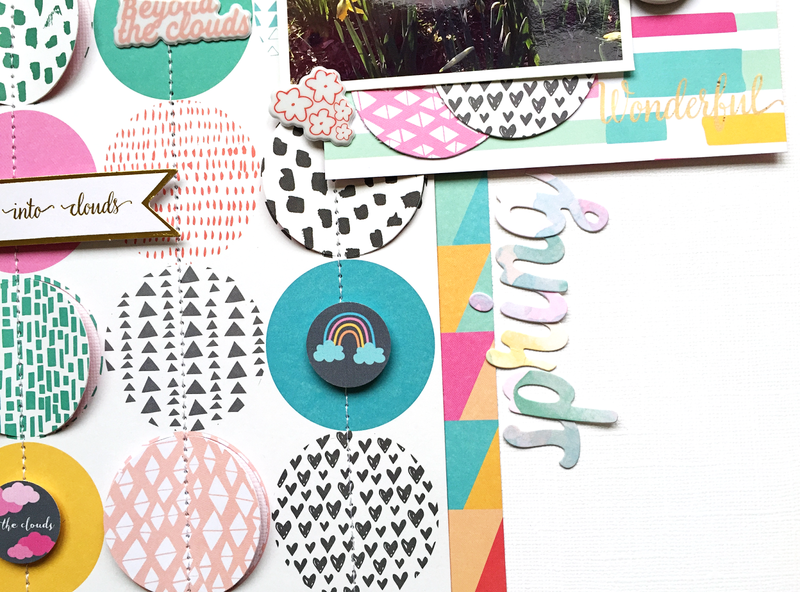 These fun and bright colors from the Pinkfresh Studio collection make me very happy as well. I knew I still had a circle coluzzle laying around somewhere and it was perfect to partially cut the circles of this paper and let the sides come up a little. Afterwards I stitched over the circles. Thank you for stopping by today! Your next stop is Kim. Love this layout! The stitching and the circles. Amazing! I love the new collection !! amainzing layout !! Nicely done colorful page! I love the circles! Thank you for sharing! I love the circles and the stitching! TFS! This is fabulous!! I love what you did with the circles. Fun layout.I like how you did the circles. Many colors!!! I loved it!!! I think the coluzzle was one of the things I set out for my cardmaking friends to take - after I'd remodeled my craft closet. Hadn't seen it used in a long time and I hadn't used it much at all. Love the layout. the circles are fun. The stitching is great - I'm too chicken to try that. I'm afraid I'll ruin my project. don't have a lot of faith in myself I guess. Great combination of all those colorful paper!! LOVELY layout, I'm also a spring lover. Great work!! I don't think you can make anything from this kit that's not AWESOME! LOVE how you cut around parts of those circles! I love all the circles and the texture of the stitching, fantastic layout!! Fabulous layouts! Love those circles! Love how you combine all the patterns! Nice going on all those circles and stitching! Love it! love how you used the circle paper - so fun!! 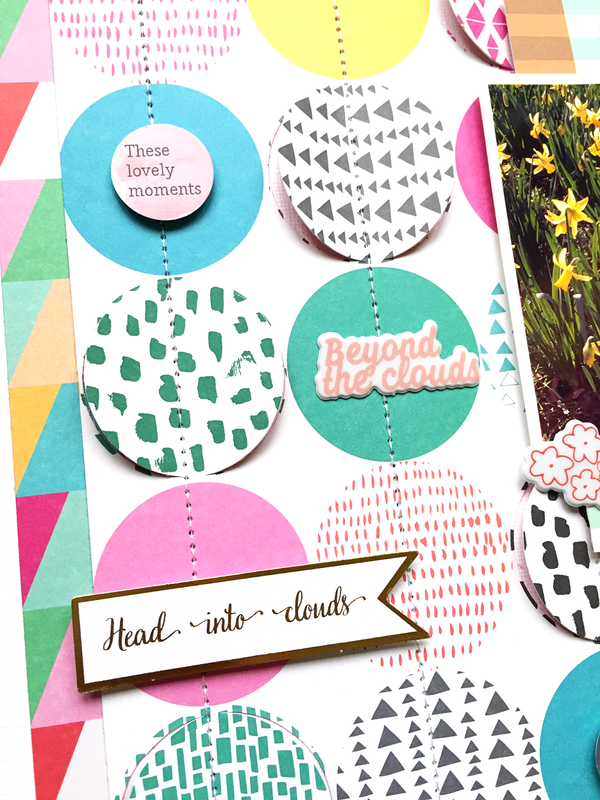 I love the way circles add so much texture to your layout!